On February 11, 2009, Sam Jain was indicted for failure to appear after pre-trial release (18 USC 3146). A federal arrest warrant was issued the same day. Sam Jain has been a federal fugitive ever since. Sam Jain has been charged with Criminal Copyright Infringement, Trafficking in Counterfeit Goods, Wire Fraud and Mail Fraud, all felonies. Sam Jain used to live in San Francisco and Mountain View, CA, and is now believed to be hiding in Brazil, India or in Ukraine. He was or still is a self-employed software consultant and attended Carnegie Melon University online. Sam Jain operated several internet-based companies including Discount Bob, Shifting Currents Financials, Inc., Innovative Marketing, Inc., Professional Management Consulting Incorporated (“PMMCI”) and Shopenter.com, LLC. Sam Jain was involved is “spamming” through the use of “pop ups” and lured internet surfers into fraudulent websites offering fraudulent Symantec products such as Norton Anti-Virus and System Works. 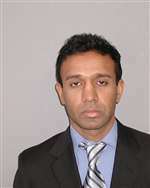 Sam Jain fraudulently acquired millions of dollars, so he is a well-funded fugitive. He has been described by people that knew him as being extremely rude and arrogant.